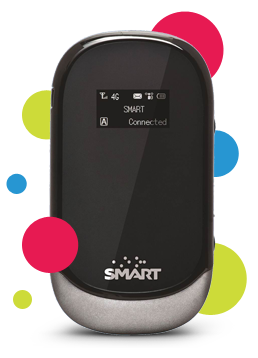 Rocket Wi-Fi is a product from Smart Communications that lets you connect your Wi-Fi enabled devices on the go with speed of up to 20Mbps. You can use it anywhere as long as your device has a signal, would be better if you use this device where HSPA+ signal is available. There is no need for you to plug your Rocket Wi-Fi broadband to connect to the internet, all you need to do is turn it on then connect your devices and bingo! You’re now connected. There’s more, you can connect up to 5 gadgets together using your Rocket Wi-Fi. Check out more features and price of Smart Rocket Wi-Fi below. This device needs a strong 4G/HSPA signal to reach the specifications speed, and upgrade to Smart Always ON to experience the speed of up to 20Mbps. You can also register to Smart Bro Unlisurf packages Smart Unlisurf Promo – Unlimited Internet Surfing for 1,2 and 5 Days Using You Smart Sim, SmartBro (Broadband) promos using your Rocket Wi-Fi.